If you love nature, your heart will be drawn to the 16th-century manuscript Mira Calligraphiae Monumenta (Model Book of Calligraphy). 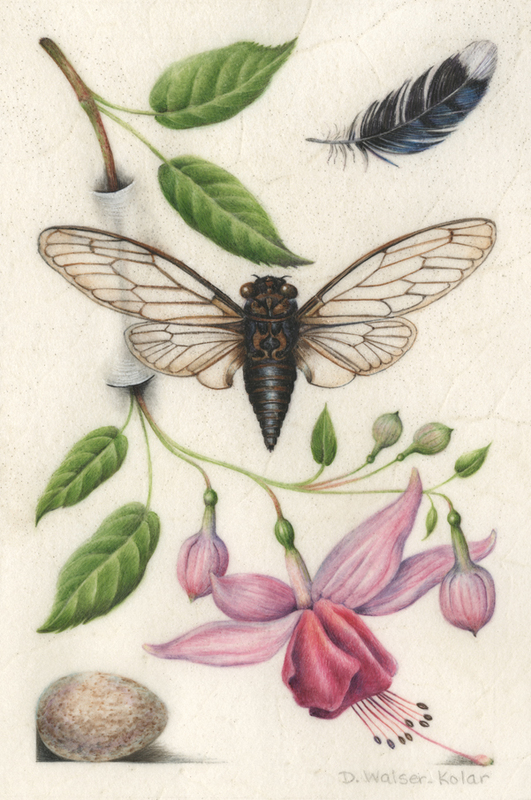 Denise Walser-Kolar’s was, and today she is at work on a 25-painting series, Hoefnagel-Inspired, that extends the book into the 21st century. The Mira Calligraphiae is the product of an unusual collaboration. Georg Bocskay, scribe to the Holy Roman Emperor, stated it in the 1560s to show off his calligraphic genius. 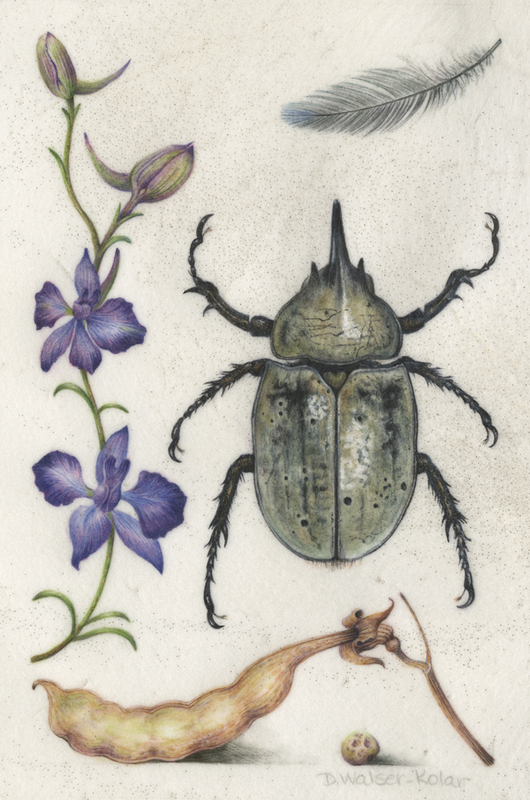 Thirty years later, court illuminator Joris Hoefnagel nestled tiny nature portraits amongst the pen strokes. 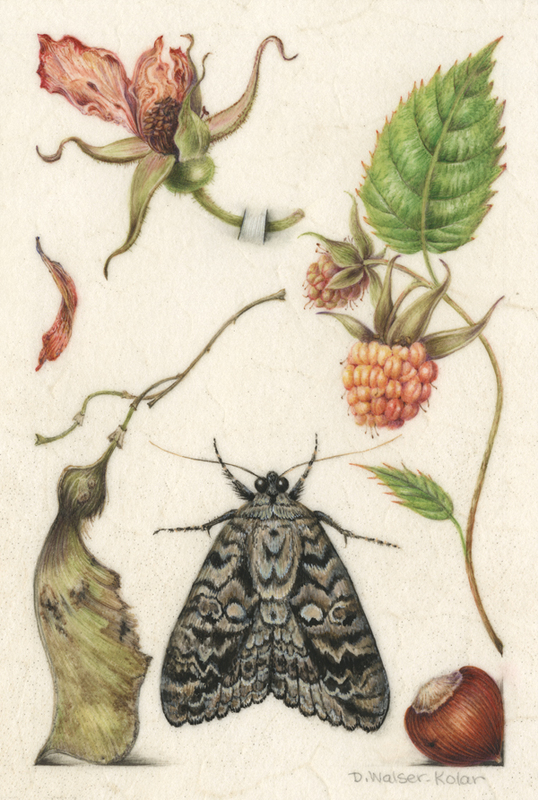 Packed into pages less than seven inches tall are tender depictions of flowers, fruit, oak galls, moths, seed pods, caterpillars, slugs, toads, and the occasional bat and snake. Many of these creatures were represented in his patron’s menagerie and collection of curiosities. The illuminations are so intricate that you need a magnifying glass—or a zoom tool—to fully appreciate them. Today I am a botanical artist, but years before I began doing botanical art, I saw the small book Nature Illuminated in a bookstore. When I opened it, it was so lovely it took my breath away and almost brought me to tears. 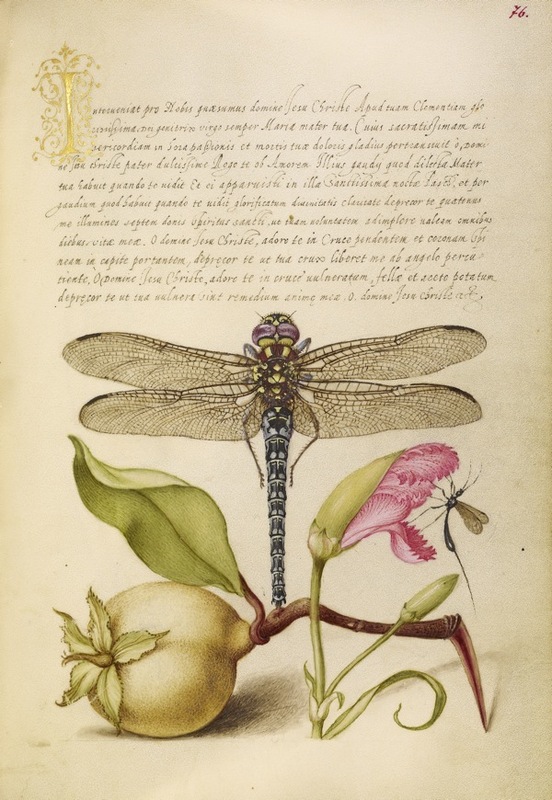 Years later, when I started taking botanical art classes, I found out about the Mira Calligraphiae Monumenta and immediately purchased the facsimile. I love the beautiful little paintings. I love how the subjects seem to have nothing to do with each other, yet go together so well. The small size and rectangular format are so intriguing. Most botanical artists are collectors—leaves, acorns, seed pods, all sorts of lovely things sit on shelves in our studios. 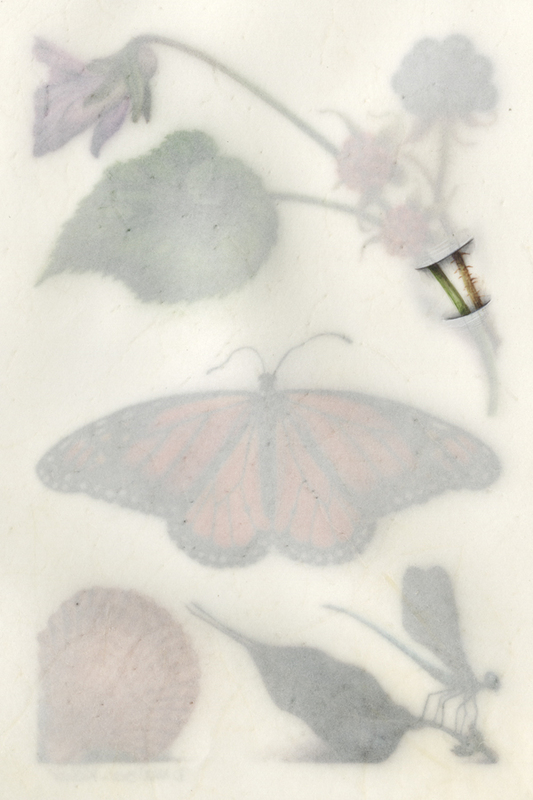 I decided to take a few of my things and create a small watercolor painting on calfskin vellum. 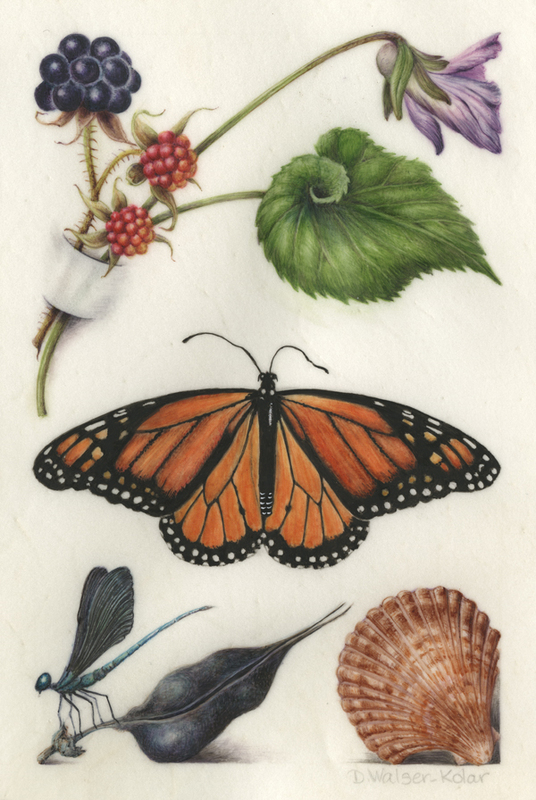 It became Hoefnagel-Inspired #1. I enjoyed it so much, I have continued the series and plan to do 25 paintings. I am currently working on my seventh painting in this series. All of the subjects are personal; I have found them or they have been given to me by someone special. 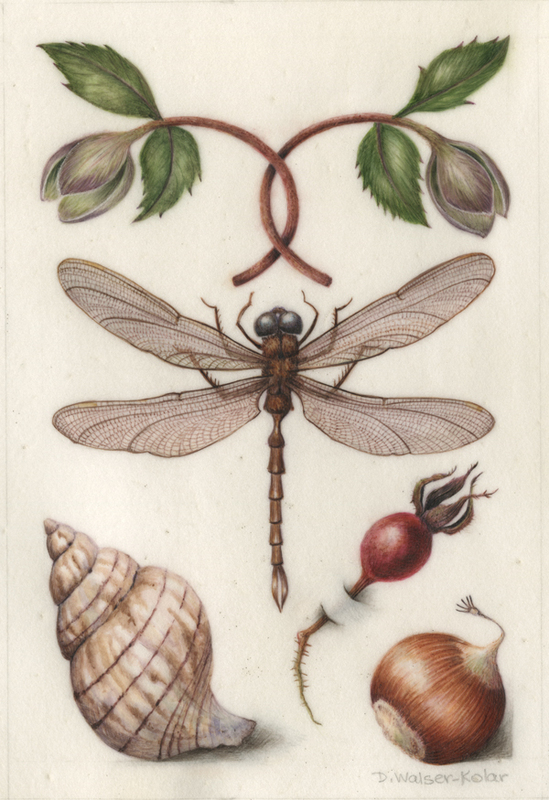 Just as the calligraphy of Mira Calligraphiae inspired Joris Hoefnagel 30 years after the original manuscript was created, now an artist almost 550 years later is drawing inspiration from his work, a kind of medieval-inspired “pay it forward.” Her illuminations have the same spirit of tender observation as Hoefnagel’s paintings, and even incorporate one of his most charming (and technically brilliant) strokes—the illusion that stems are tucked into slots in the parchment. We thank her for sharing her beautiful work with us, and look forward to the completion of the series! Have you been inspired in your creative practice by art in the Getty’s collections, or by the architecture or gardens? We would love to hear about your work. 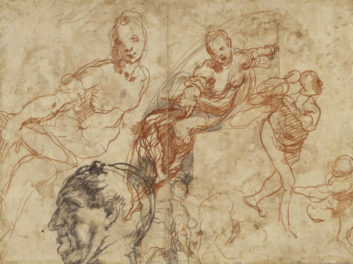 Please share it with us on Twitter @thegetty or by email at blog@getty.edu. Great article by Marrak. 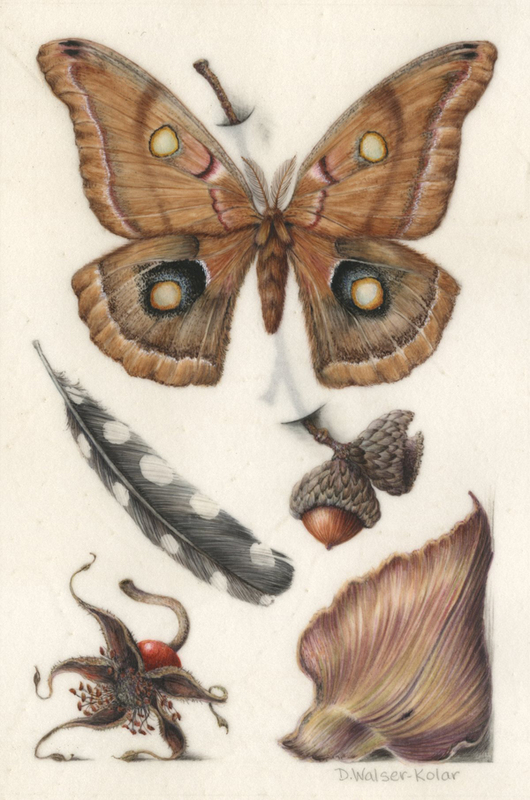 Fascinating artworks by Hoefnagel! Her attention to detail is wonderful, and as awe inspiring as that of the scribes and artisans who inspired her! 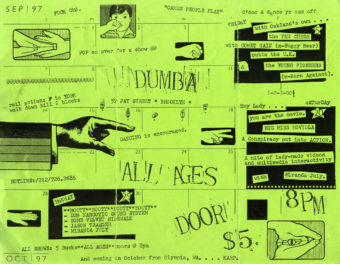 I also have a newfound appreciation for illustrations due primarily to reading this article! Thanks to the IRIS for the opportunity. Wonderful article. The artwork is simply stunning and such a pleasure to view. 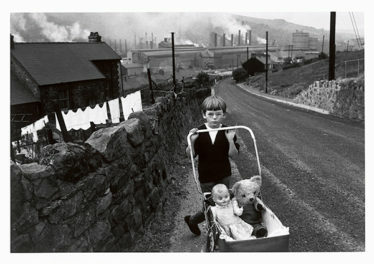 I am looking forward to seeing more of Denise Walser-Kolar’s work.